Manager Lee Clark hopes Blackpool can build momentum following his first win in charge and lift themselves off the bottom of the Championship table. 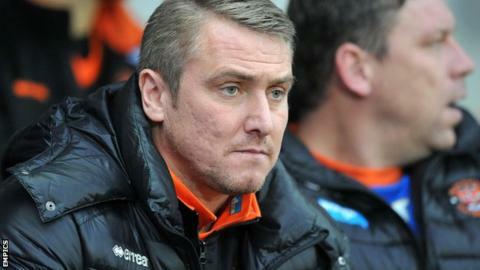 Blackpool's 1-0 triumph over Birmingham City on Saturday came 47 days after Clark was sacked as Blues boss. Victory was the Seasiders' first in six games since the 42-year-old moved to Bloomfield Road, and stretches their unbeaten run to three games. "We've closed the gap a little bit but we've got to continue," said Clark. Victory moves Blackpool to within five points of Wigan Athletic in 23rd place and eight points from safety. Talking to BBC Radio Lancashire, Clark continued: "We cannot come in and be all giddy because we've won on Saturday. "It's refocus, do exactly what we've done last week. We're going to work them hard because we believe we can get them fitter - the fitter they are, with the ability they have, we can become a better team." Striker Steve Davies scored the winner for Blackpool against Birmingham after latching onto goalkeeper Joe Lewis's long ball forward before finishing past Darren Randolph. After recovering from injury the former Bristol City, Derby and Tranmere striker has now scored in consecutive games, and Clark believes the 26-year-old will improve. "Unfortunately, when I got here he had the injury," said Clark. "But he has worked hard, and he's going to get better because he's going to get fitter. "He had to come off as he was absolutely shot to pieces. He asked me to take him off, and thankfully you've got someone like Ishmael Miller who can come on and carry on the baton. "He's shown me his ability in training. We've got some good footballers in the middle of the field and in the wide areas, and I think a big target man who's got a good touch compliments them. "The players are starting to learn about their roles and responsibilities in the team, and we had some terrific performances individually out there."